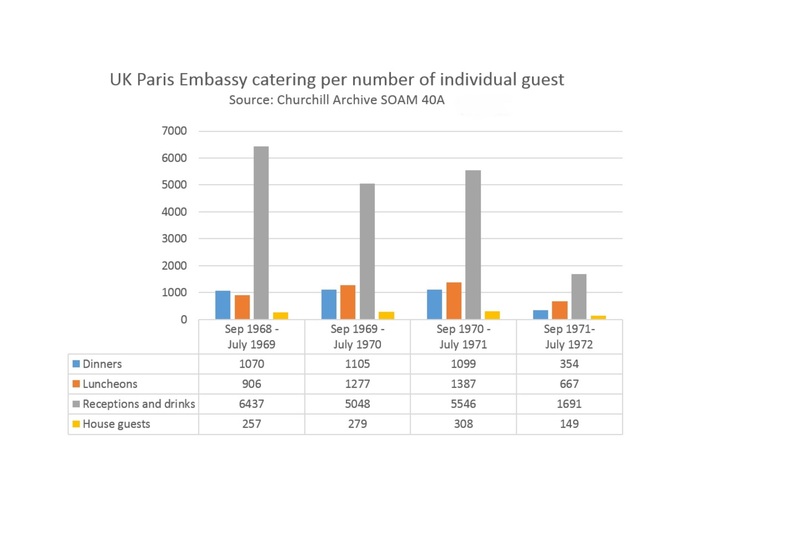 The hospitality records of Christopher (later Lord) Soames for 1968-1972, while HM Ambassador to Paris, reveal the scale of this “campaign.” The drop-off in receptions for the year Sep 1971-1972 may perhaps be attributable to the agreement in principle reached with President Pompidou, during lunch meetings with Prime Minister Edward Heath at the Embassy on 21-22 May 1971, that France would not oppose British accession. The attendance list for Paris Embassy receptions reads like a Who’s Who of post-1945 France, excepting of course President Charles de Gaulle (d. 9 November 1970), whose absence is scarcely surprising given the bruising vetoes that he applied against the British membership applications in 1963 and 1967. The spectrum of those who attended was, nonetheless, broad, including tough Gaullists such as Couve de Murville, who had opposed earlier British accession attempts. British hospitality reached into the inner workings of the French state, and groups of Prefects (lunch, 15 Feb 1970) and Deputies (lunch, 14 March 1972) were also welcomed. < Extension teaching and learning for Sixth Form History. What’s next ?